Today’s plan was to spend the morning taking 9 shallow firn cores. From these cores we would locate a single firn layer present in all nine cores that could be used to help determine the spacial variability in the permeability of a single layer of firn. Permeability is the measurement of how easily a fluid can flow through a porous medium. In our case we would be measuring the flow of air through the firn. The cores had to be at least 2 meters deep (6.5 feet) in order to have firn cores that would not fall into pieces when they were taken out of the ground. The plan seemed simple: drill 9 shallow cores, find the same layer in all 9 cores, and measure their respective permeabilities. Lesson of the day: In the field, things are never as simple as they seem. Upon inspecting the hand drill that was onsite we found it was not in working order. 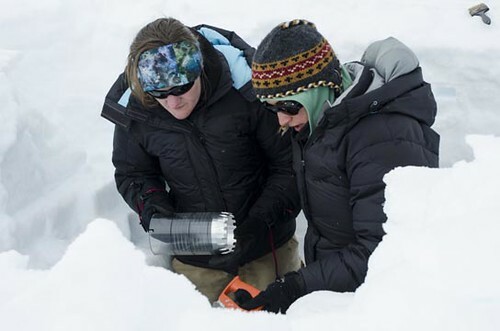 While we were trying to bring the drill back to life the majority of our group did snow pit measurements consisting of stratigraphy, densities, temperature profiles, and hardness. The snow pit measurements continued until we stopped for lunch. While eating our delicious lunch we got the news that the drill was functioning properly (woohoo!). Our first task after lunch was to drill our first firn core. The first meter of the core went well. The second meter of the core went well. The last meter of the core went well… until we tried to remove it from the ice sheet. Turns out, it really didn’t want to leave its home. We tried turning the drill to back it out, tapping it to loosen the connection with the underlying firn and pulling up as hard as we possibly could. The drill didn’t move an inch. 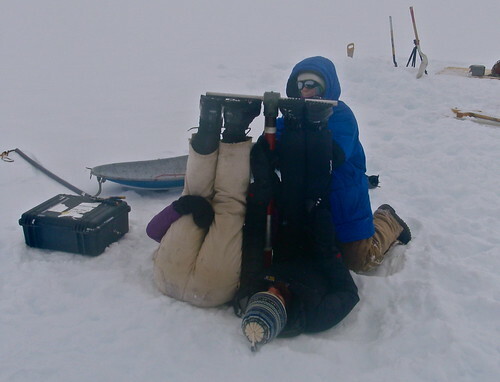 The method that finally proved successful was to have Courtney and Lee lay on their backs and essentially leg press the drill out of the borehole. For some fantastic footage of the event check out the video below. Overall we had a very productive day in the snow pit and an excellent learning experience on how sometimes the field determines the work you can actually do. 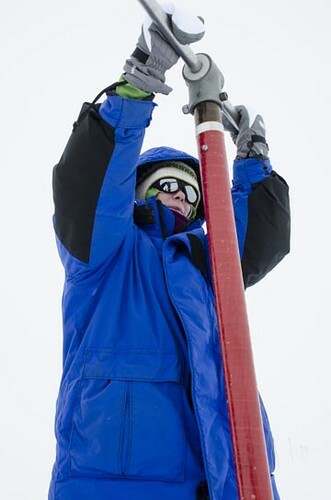 The new plan is to determine the spatial variability in the permeability of single snow layer. No drilling necessary. Nice use of IGERT power, Ladies!!!! Women’s Leg Press, a new Olymic event! This looks more like yoga on the ice. I hope those pants are insulated. Ingenious problem solving! Congratulations.